THE KILLERHERTZ is a very new band from Denmark, they just released their brand new album “A Killer Anthem” and I must say that it is an extremely refreshing new Hard Rock album! There are very critical listeners out there when it comes to their tastes in music, those listeners will really appreciate “A Killer Anthem” by THE KILLERHERTZ because it has what rockers crave! What do rockers crave you ask? Pure, solid, and genuine Hard Rock! There is very little of repetitiveness when it comes to the music THE KILLERHERTZ creates! Do you want something new? Do you want something that will rock your socks off? Then check these guys out and I guarantee that you will thoroughly enjoy “A Killer Anthem” by one of the best new and upcoming bands out there today! Ok, let’s get to the songs, I rarely like to choose just one or two songs to put focus on, and let me tell you that when that is the case, there is usually only one or two good songs on those new albums. My thoughts are that in “A Killer Anthem” every song stands out in its own way, you will have your classic Hard Rock tunes mixed in with a lot of the new aged style of the more popular mainstream bands that get constant airplay. I honestly cannot figure out the issues with mainstream music these days, I have fought so hard in the past few years to promote quality new music in hopes that we can all team up and push actual good Rock/Metal into the mainstream world, it is such a battle! When I get the pleasure to review such good music from bands like THE KILLERHERTZ I feel honored to do so! I would really like to see new music like this make it into the mainstream world, I will continue to fight for the right to rock for us all! Now for a little comparison, ready for it? MEGADETH is the band folks! Imagine a somewhat sleazy, yet new age MEGADETH sound, well you do not have to imagine, it is all right here in “A Killer Anthem” by the super cool new band THE KILLERHERTZ! I think fans of all ages will take a fine liking to these guys, I know I sure have! We get a lot of new independent music here at Metal Temple, some of it is so so, yet most of it simply rocks hard and deserves a lot more recognition! Slowly but surely people will catch on, it takes a lot of hard work from people on all sides of the coin! I would like you fans to do your best to support THE KILLERHERTZ and purchase their new album “A Killer Anthem” as soon as possible! It is a critical time for their band, and now is the time for the push, it is what builds solid foundations for new bands! I like “A Killer Anthem” quite a bit, it has a classic Hard Rock sound with a Heavy Metal tinge, gritty yet clean vocals, and what really stands out for me is some of the best guitar work that I have recently heard! 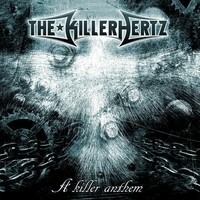 “A Killer Anthem” by THE KILLERHERTZ gets a killer nine out of ten!